During the second apparition in the summer of the same year, the angel urged the children to pray and offer sacrifices for the conversion of sinners. In the angel’s final appearance, he prostrated himself on the ground before a vision of a chalice and host and said, “Most Holy Trinity, Father, Son and Holy Spirit, I adore You profoundly. I offer You the most precious Body, Blood, Soul and Divinity of Jesus Christ, present in all the Tabernacles of the world, in reparation for the outrages, sacrileges and indifferences whereby He is offended. And through the infinite merits of His most Sacred Heart and the Immaculate Heart of Mary, I beg of You the conversion of poor sinners.” Then he gave the Chalice to Jacinta and Francisco and the Holy Communion Host to Lucia. 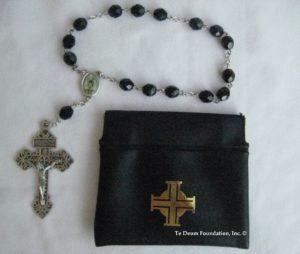 Over many years these prayers were prayed on the rosary beads by several of the religious orders in Fatima, Portugal. In the summer of 2004, Father Christopher Roux, while on pilgrimage in Fatima, visited the Irish Dominican Sisters of the Perpetual Rosary. One of the Sisters presented Father this “Rosary of the Angel” and encouraged him to present it to his Bishop for approval. Bishop Peter J. Jugis of the Diocese of Charlotte, North Carolina, had a great desire to encourage Eucharistic Adoration and so he formed and named the prayers the Chaplet of Adoration and Reparation. Bishop Jugis placed his imprimatur on this chaplet December 8, 2004, during the Year of the Eucharist. The Te Deum Foundation developed the chaplet prayer card with the image of the Three Little Shepherds receiving the Chalice from the Angel. This image which presents the Three Little Shepherds and the Angel is in a stain glass window high above the sanctuary located in the Basilica of Our Lady of the Rosary in Fatima. The prayer card of the Chaplet of Adoration and Reparation was produced under the guidance and approval of the Shrine of Our Lady of Fatima and is now available in many languages. The proceeds from this card help the mission of the Te Deum Foundation to “Build a Seminary” in the Southeastern United States.